Not much to report tonight. I spent about 45 minutes riveting the bottom of the right aileron. All I had left to do was squeeze a few rivets on the ribs and then pull the blind rivets where the skins meet the spar. It starts by putting the aileron, bottom facing up, on my flattest work bench, and then weighing it down to ensure it stays aligned, and not twisted. I found that the center section is just about perfect, and I added a little more weight with my cleco bucket. 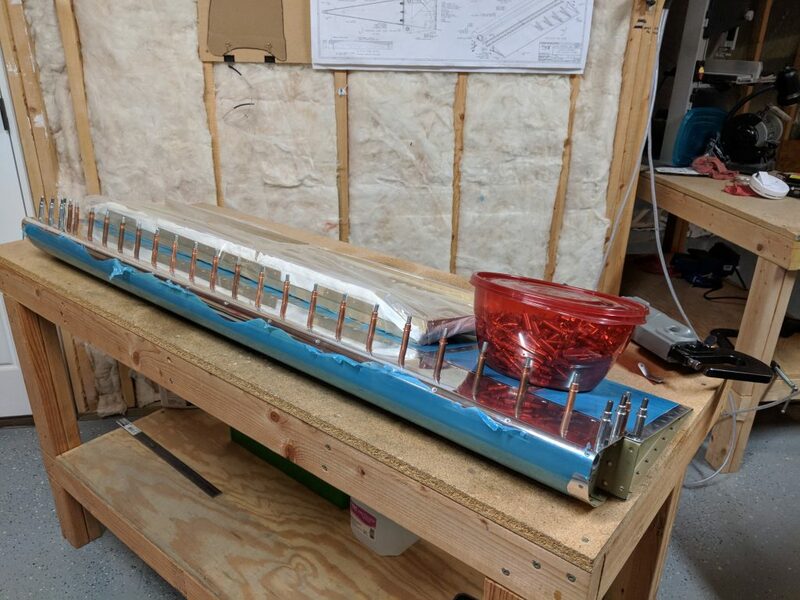 Once it was weighed down, and I had checked the flatness, I set the blind rivets along where the counterbalance pipe is attached to the leading edge skin, checking the aileron for twist and aligment every few rivets. Next up I squeezed the last few rivets; first along the leading edge skin, and then along the trailing edge. Once that was done, all that was left was to set blind rivets that join the top and bottom skins to the spar. The pneumatic rivet puller I bought makes this easy and quick…. $25 well spent. The Right aileron is now finished and is on the shelf. Like the left one, I did not attach the mounting brackets just yet. I’ll leave them off until I get ready to mount the aileron to prevent damage to other parts. At this point, I am ready to move on to something else in the build. I was going to dive into the tanks, but I need the wings on the stands in order to fabricate the mounting brackets. SO, I guess I will jump back to the ribs, and finish them up and build my wing stands. I need to order some conduit, and some reamers. I need the conduit so I can drill our the holes in the ribs for it to go through. Time to spend some money I guess! Tagged Right Aileron, Blind Rivet. Bookmark the permalink.